#SendMe || South Africans want to be part of the journey || Responding to the call || How can you get involved? 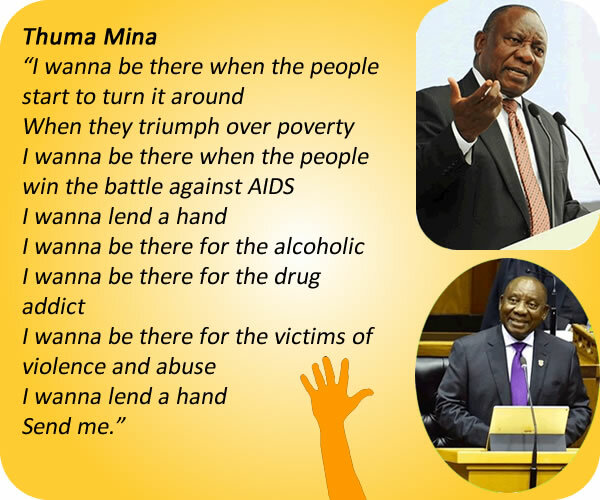 "Thuma Mina - Send Me"
In his inaugural State of the Nation Address, President Cyril Ramaphosa quoted the song “Send Me” by the late great musician Hugh Masekela. In doing so he inspired South Africans with the themes of self-sacrifice, individual responsibility and the importance of personal change in mind-sets. It framed a new era where we as individuals make it our personal responsibility to confront our challenges and accelerate progress in building a prosperous society. South Africa belongs to all who live in it and it is not possible for government alone to undo the detriments of apartheid. All South Africans as individuals, groups or communities must roll up their sleeves and work towards our future. It links directly with our National Development Plan’s (NDP) objective of “Building an Active Citizenry”. The NDP emphasises the need for South Africans to unite around a common goal, ensure citizens are active in their own development, and build a capable and developmental state. It foretells a country where through our collective efforts we have eliminated the triple challenge of poverty, inequality and unemployment and enabled all South Africans to achieve a decent standard of living. The majority of South Africans want to be part of building a better country and are keen to play a positive role in their communities. The “Thuma Mina-Send Me” movement provides an opportunity for citizens themselves to get involved in the areas that concern them the most and to which they want to bring lasting change. 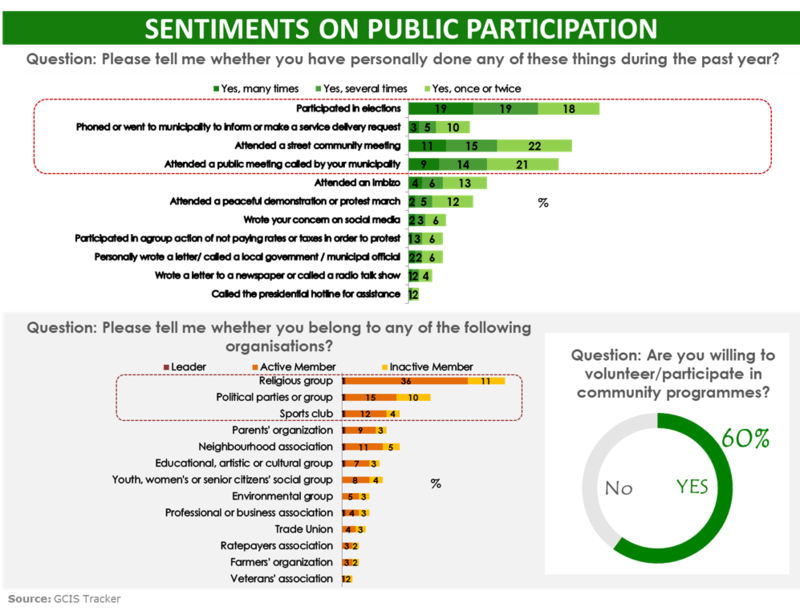 Research shows there is an inherent desire and strong sentiment among citizens to be involved in their communities. The GCIS Tracker research (Jan-March 2018) shows that 60 per cent of South Africans are willing to volunteer or participate in community programmes. 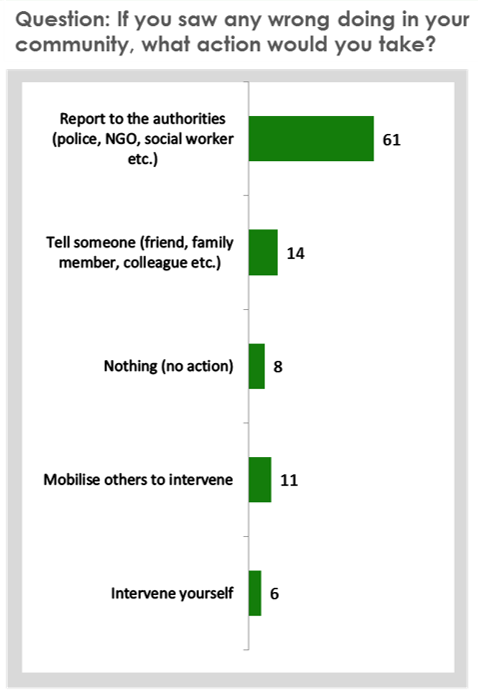 Importantly, the majority of citizens are also willing to take a stand by reporting wrongful actions in their community. 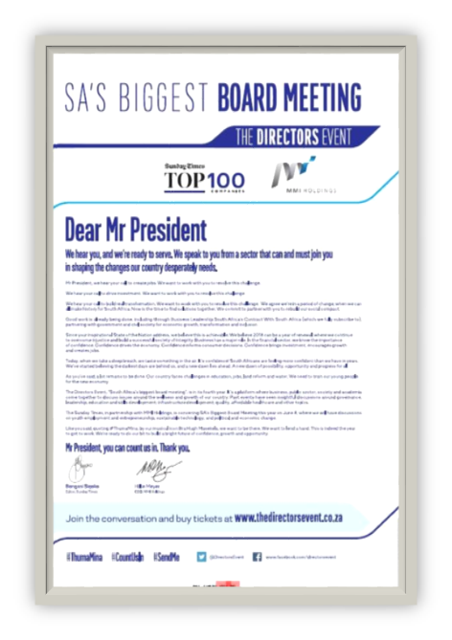 The desire to be part of the solution is also reaffirmed by Brand South Africa’s Domestic Perceptions Research which shows that active citizenship levels among South Africans stands at 62.7 per cent. Moreover, over 60 per of respondents say they are extremely proud to be South African. South Africans across the country have rallied to the call by the President with many taking to social media under the hashtag #SENDME volunteering to be part of the change. On the ground the “Thuma Mina-Send Me” movement is translating into tangible acts. 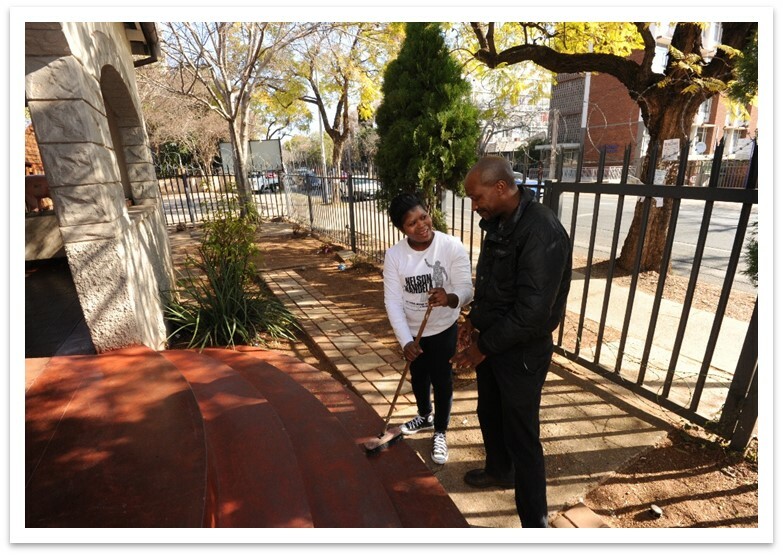 An example is how employees at the Protea Magistrates Court in Pretoria launched a weekly clean-up campaign. They decided to sacrifice their hour lunch break each Friday to clean the outside area of the court. The employees took the decision to title their clean-up campaign, the ‘Thuma Mina Cleaning Campaign’. “We realised that the environment we work in is not as clean as we wanted it to be so we decided to put an effort into it and make it the way we want it to be,” said Susan N’wa Maluleke Maswanganye, Area Court Manager in Soweto. “I feel that we’re going to be more productive when we work in a clean place because a dirty place demoralises us. Members of the public will feel welcome because a dirty court most likely gives them the impression that we don’t know what we’re doing,” said Pinky Kgaile, Admin Clerk at the Protea Magistrates Court. 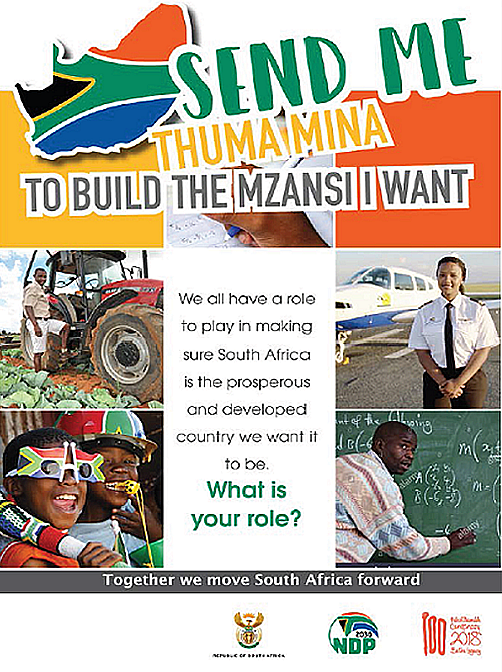 Everyone can get involved in building our society, all it takes is each one of us, in the words of the late great Bra Hugh Masekela in his song ‘Thuma Mina’, to boldly proclaim “send me”. If thousands of people begin taking the same positive action, soon it will become the norm. 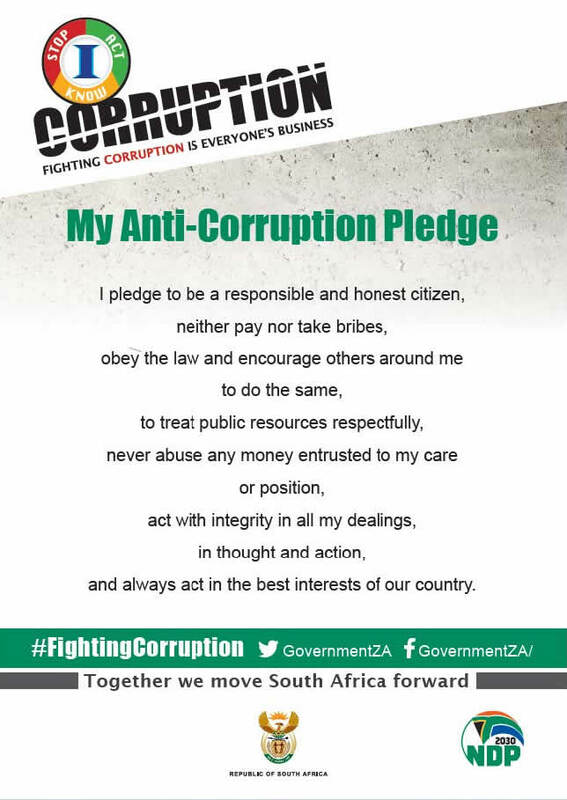 In the spirit of “Thuma Mina – Send Me” we can all get involved and let our actions speak louder than words. Everyone has a role to play: It begins with a realisation that everyone has a role in building the South Africa we want. It is a call on all South Africans to get directly involved in finding solutions to the challenges we face. Change starts with you: Be the change we want to see. You can use the power of personal change to drive social change so that we get closer to the realising Vision 2030. Practical actions can include not littering, reporting illegal activities in your area, don’t drink and drive, and teach your children to respect the rights of others by your example. Be accountable and responsible: Be someone who pulls his/her weight, is accountable and takes responsibility for their actions. It is also someone who considers what effect their actions or inactions will have on those around them. Form partnerships and groups: Join with others in your community to build a movement to bring change and help turn things around. In the fight against crime let us partner with our local police station by joining the local Community Police Forum. Spread the message: You can ignite a conversation in your community that leads action and support of the less fortunate. Through compassion and respect for each other, we can show our commitment in building a better society for all. Forward this to a colleague.